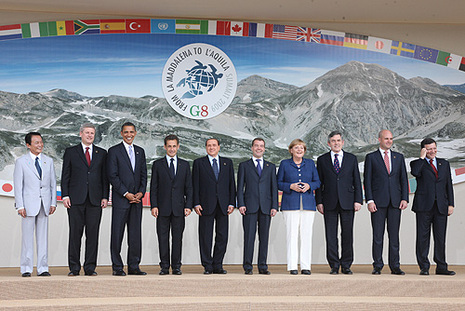 The 35th G8 summit took place in the city of L'Aquila, Abruzzo, on July 8–10, 2009. It was moved from the Sardinian seaside resort of La Maddalena as part of an attempt to redistribute disaster funds after L'Aquila was struck by a devastating earthquake in April 2009. The locations of previous summits to have been hosted by Italy include: Venice (1980); Venice (1987); Naples (1994) and Genoa (2001). The G8 Summit has evolved beyond being a gathering of world political leaders. The event has become an occasion for a wide variety of non-governmental organizations, activists and civic groups to congregate and discuss a multitude of issues. The Iranian government has made a formal complaint to the Italian government about "violent suppression of justice-seeking protesters by the Italian police." It-Silvio_Berlusconi.ogg Silvio Berlusconi (help·info) (born 29 September 1936) is an Italian politician, entrepreneur, real estate and insurance tycoon, bank and media proprietor, sports team owner and songwriter. He is the second longest-serving Prime Minister of the Italian Republic (President of the Council of Ministers of Italy), a position he has held on three separate occasions: from 1994 to 1995, from 2001 to 2006 and currently since 2008. He is the leader of the People of Freedom political movement, a centre-right party he founded in 2009, merging Forza Italia, his own party, with Alleanza Nazionale of Gianfranco Fini and other parties. His victory in the 2008 general elections paved the way for a third mandate in office. As of January 2009, he is the senior G8 leader, the longest-serving current leader of a G8 country.